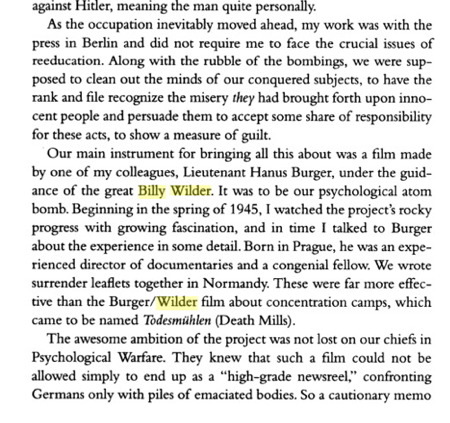 [See: [1945-48] Dachau Trials.] At the Nuremberg International Military Tribunal which prosecuted the German war criminals in Novemer 1945, three members of the American prosecution team provided sworn affidavits, testifying to the existence of lethal gas chambers at the Dachau concentration camp, but these affidavits were not introduced into the proceedings of the American Military Tribunal at Dachau, which also began in November 1945. The internet video Buchenwald: A Dumb Dumb Portrayal of Evil episode 8, makes a photo comparison to assert that it is Jackson presenting the table objects to the crowd of Germans on the forced tour. 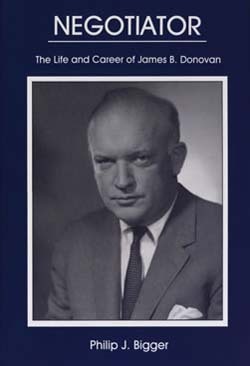 The video then references a number of New York Times articles to show Jackson's connection to Eisenhower. See note 12 for more on Jackson. The lampshade in the footage and the subsequent New York Times reportage of it, is the first source of the lampshade rumour in the USA. The footage made it's way into newsreels shown to American audiences in late April and early May of 1945, and likely was in the footage shown to the House and Senate around the same time (see note 9.) The lampshade itself disappeared after being filmed on April 16, 1945. The two shrunken heads are portrayed as being Buchenwald inmates, but Buchenwald inmates had their hair cut with clippers upon arriving at camp. In addition, the video Buchenwald: A Dumb Dumb Portrayal of Evil, episode 3 shows camp footage of liberated inmates where all of the inmates have their hair cut extremely short.